The March holidays are going to be here very soon and since it's the first ever school holiday for the big girl, I hope to make it a special and fun-filled term break for the kids! Besides planning a staycation for that week, we have something real cool, yes I do mean cool, to look forward to! It's Disney on Ice presents Magical Ice Festival! Oh gosh, just saying that mouthful makes me all thrilled already! I mean, who doesn't like Disney and to be able to see all your favourite fairytale characters come to life and perform awe-inspiring stunts on ice, that's like a dream come true not just for the kids, but for me too! I still remember how much all of us enjoyed Treasure Trove two years ago and now that the kids are a little more grown up, I bet they are going to love the show even more! Plus, guess what? The girls have been yearning for this and that long-awaited moment has finally arrived - we are going to see Elsa and Anna on ice! Yes, you read it right! 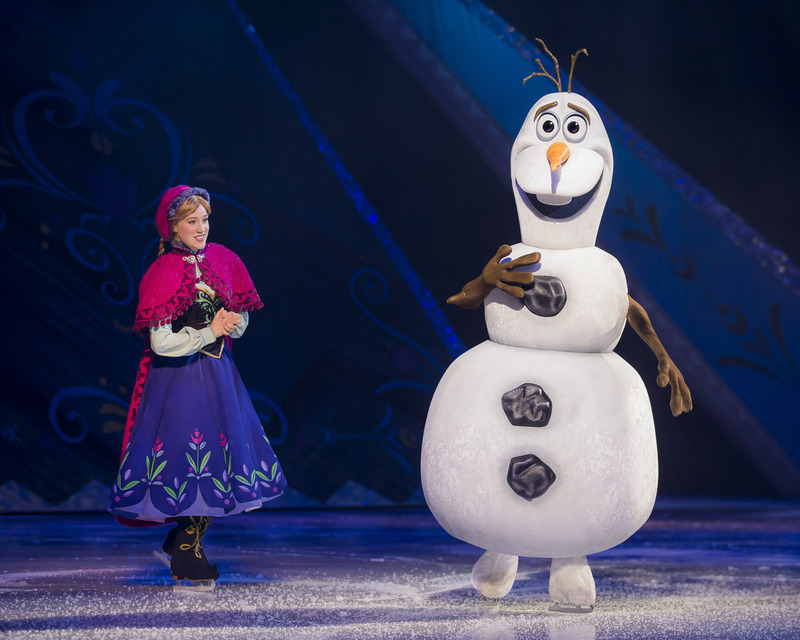 All the Frozen fans will be thrilled that their favourite characters are going to be part of this year's Disney on Ice show! I bet my kids can't wait to meet the cool-looking Ice Queen and their favourite snowman! From 11 March 2016 to 20 March 2016, get ready to enter a world of enchantment featuring the most magical moments from across the kingdom in Disney On Ice presents Magical Ice Festival. This year’s theme, Magical Ice Festival, takes you on a sensational journey with your most loved Disney characters on ice. Experience a medley of Disney movies from The Little Mermaid to Beauty and the Beast, with special appearances from characters of the Academy Award winning and Number One Animated Feature Film of all time – Disney’s Frozen! Audiences will journey up the North Mountain with the hilarious snowman Olaf, rugged mountain-man Kristoff and his loyal reindeer Sven as they help the sisters along the way in a story full of action, adventure, magic and unforgettable characters. In a new twist on fairytale fun, comical segments from everyone’s favorite Disney characters set the scene for the show stopping on-ice stories of princesses Ariel, Rapunzel and Belle. We have been waiting for a film like Frozen too and having two girls in the family makes the show resonate with us even more deeply and I hope these two will always remember to love, to care and to sacrifice for each other. Side by side or miles apart, sisters will always be connected by the heart. Pssst, the last we heard, Frozen 2 is already in the making too! Produced by Feld Entertainment, Magical Ice Festival is an enchanting mix of royalty, highlighting the stories of Disney’s most beloved heroines with energetic choreography that will have audiences singing, dancing and cheering their favourite Disney characters as they each embark on their own epic journeys. It will be a magical mix of royalty when Disney On Ice brings this winsome wonderland to you. 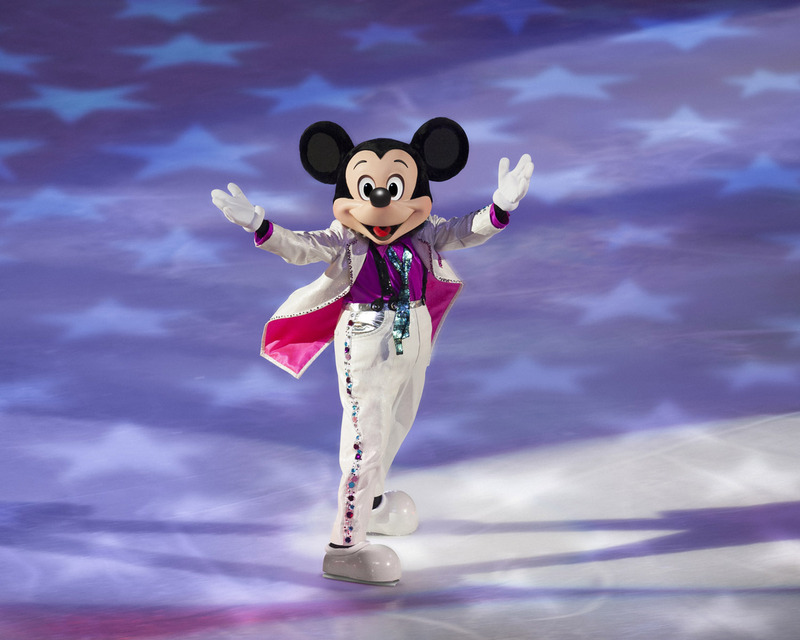 With an extraordinary line-up of hit songs, memorable scenes and never-before-seen characters to look forward to, here are 10 fun facts behind Disney On Ice! Just to test yourself to see if you are a true Disney fan, see if you can answer these trivia! 1) In which kingdom do Anna and Elsa live? 2) Who helped Young Anna recover from being hit by Elsa’s powers? 3) Who likes "warm hugs"? 4) How many sisters does Ariel have? What are their names? 5) Ursula gives Ariel the ability to walk on land. How long is this ability supposed to last? 6) What is the name of the tavern where Flynn and Rapunzel meet a bunch of Viking thugs? 7) What is Flynn Rider’s real name? 8) What does the Beast give Belle to always remember him by? 9) What part of the castle does the Beast forbid Belle to go to? 10) Name at least three of the enchanted characters that live in the Beast’s castle. 6) The Snuggly Duckling 2. Now, are you as excited about this event as all of us are? 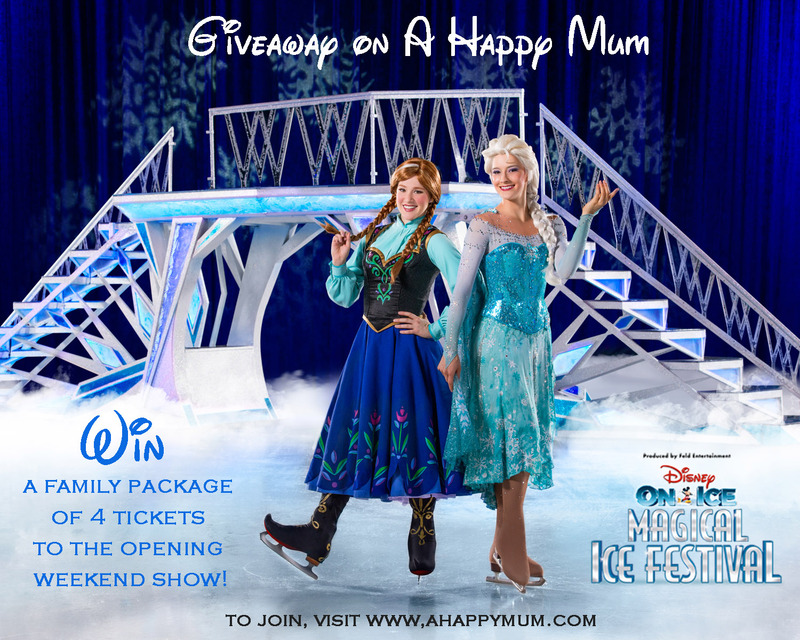 For those of you who are interested, here's a giveaway where one reader will get to win a family package of 4 tickets to Disney on Ice presents Magical Ice Festival! 1) Event venue will be at the Singapore Indoor Stadium. 2) The family package of 4 tickets is worth approximately $300. 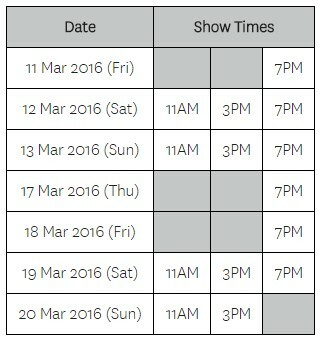 3) Tickets will be valid for one of the opening weekend shows on either 12 Mar (Sat) or 13 March (Sun). Showtimes are at 11am, 3pm and 7pm. Exact date and time to be advised by organiser at a later date. 4) Changes to date/time will not be allowed. 5) This giveaway will end on 17 Feb 2359hrs. The winner will be contacted via email and will have 72 hours to respond. Otherwise, a new winner will be picked. To participate, leave a comment in this blog post with your name, email address and tell me which character your child is most looking forward to seeing at Disney on Ice presents Magical Ice Festival. Indicate in the Rafflecopter widget that you have done so and to increase your chances of winning, you can choose to carry out the rest of the options. Best of luck! a Rafflecopter giveaway Disclosure: We received a media invite to attend Disney on Ice presents Magical Ice Festival. All opinion are our own. My 4 yr old boy is enamoured by Elsa and he is one of the few boys i know who loves everything about Frozen. He has Frozen pyjamas, frozen water bottles, and frozen dolls. He would love to see Elsa in real life! My 4.5 yr old girl lovesss Frozen especially Elsa and Anna. She has a younger sister and both of them live to act as princesses. It will be a wonderful experience for her to see Elsa and Anna live. So looking forward to winning this. Thank you! My girls are crazy fans of Frozen and Disney ! They will be thrill if they can meet Anna ! Thanks for the chance! Big k and even small K r crazy over Elsa and Anna!!! Really hope to win this magical experience!!! My kids would love Frozen. They will be very excited if they have the chance to see Princess Elsa. My children will love to meet Elsa! No doubt my girls are in love with Frozen , especially Elsa ! Whenever my 6 years old girl saw the colour blue , she'll say that's Elsa . And always saying her Mei Mei is Anna�� Both are attracted to the songs ' Let It Go ' & ' Do you wanna build a Snowman ' My 19 months old toddler will stop whatever she's doing once heard the song ! My daughter definitely love to meet pretty Elsa. "Let us go, let us go, let us go to the show PLEASE"
Elsa and Anna seems to be the hot favourite but we are abit old skool.. we still love to see the adorable Mickey and his pals! My 7yrs old girl would love to meet Elsa and Anna. My 5 yrs old boy would love to meet Olaf and Elsa! My little girl is definitely looking forward to meeting Anna from Frozen! My boys will love to see Olaf, Elsa and Mickey! Hope to win it to give my princess a belated birthday surprise. My girl is in love with elsa and Anna! And also Ariel and Cinderella and rapunzel! My girl is a big fan of all princesses so she would loves to meet them in person. My boy is a big fan of Disney Elsa & Anna been watching numbers of times in preschool & at home. He can even sing along with the show. Hope to win & watch live performance. My niece is looking forward to see Elsa at Disney on Ice presents Magical Ice Festival. Name : Suzanna Lim, email address: siokhoon@rocketmail.com. My child is a fan of Elsa from Frozen and look forward to seeing at Disney on Ice presents Magical Ice Festival. My 8-year-old girl loves princess and fairy. She is definitely looking forward to see Elsa and Anna at the Magical Ice Festival. Wow.. Thanks for the awesome giveaway. My little angels are extremely excited to see Elsa & Anna . I had 2 daughters like Frozen Sisters which love each other and taking care of each other every moment. My elder daughter 9yo she love Elsa so much she mentioned to us that she like Elsa which call 'JIE JIE' that show good example to her Mei Mei each of every time. As for my youngest daughter 6yo she love Anna so much she like Anna so playful and cheeky character, always need JIE JIE to help her. Both sister's is like Frozen Sister's sing a long play along when they watching Frozen show, is so lovely to see them play n laugh. If I can win this tickets definitely my both gals will very excited and happy they will plan to wear Frozen costume to watch Disney On Ice Frozen show on that day. At this moment we didn't plan any program for this March holidays hope this come to my both gals a dream and surprise. The tickets of 4 just nice for my family. Thank you A Happy Mum for this awesome giveaway. Liked n shared & participated. My 5yo daughter likes all the Disney princesses especially Ariel the little mermaid! my kids would love to see Elsa and Anna. They wish to meet good old Mickey, cmeilim@gmail.com. Thanks for organising this giveaway! Hope to win the family for my kids as they both love Elsa and Anna very much! 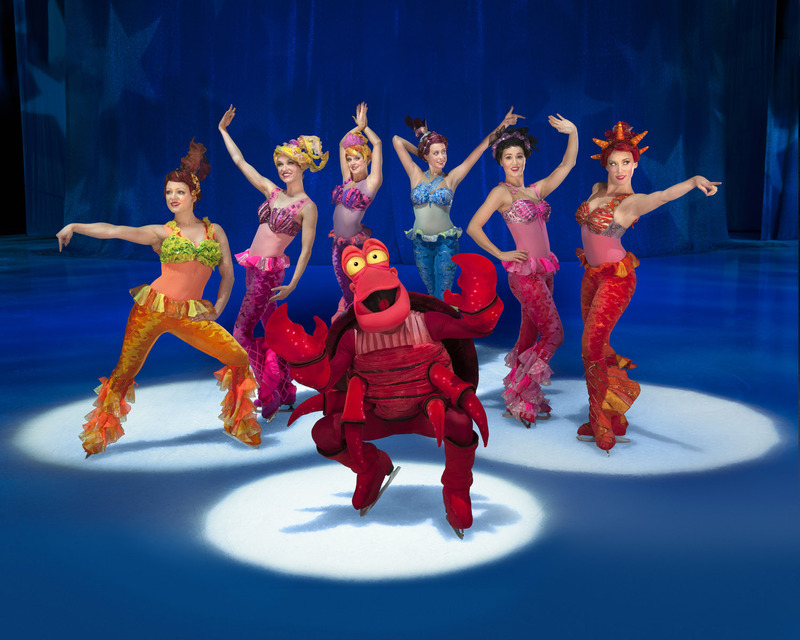 It would be really an awesome experience to the girls as they haven’t had any chance to go Disney on Ice before. THanks!! Happy Chinese New year to you and family! My little one loves Elsa and Olaf. He'll be thrilled to meet his beloved Queen Elsa in person. Though I'm not sure if he'll be shock at how much Olaf has grown. This is exciting. Hope to win! Thank you for the giveaway! She would love to meet up Elsa! My girl loves to see Elsa and Olaf! Hope to win this great giveaway for her! Wish me gd luck! MIckey mouse, Olaf and Anna. Definitely has to be Frozen characters of Elsa and Anna!!! We would love to see olaf! Thanks for organising this great giveaway, hope to bring my trios for the show. My girl loves Anna and Elsa. She will request for her hair to be tied the same way as them. Definitely these cute little niece and nephew is looking forward for it's Frozen character, Anna & Elsa ! Hehe, they love to sing to their song ! Would love to bring my 4 year old to her first Disney on Ice! We would be absolutely stoked to see Elsa live and on ice somemore! Not only girls going crazy over Frozen, both my sons love watching Frozen too! My elder son loves princess Anna as she's daring, optimistic and also sacrifice herself to save her sister. He will definitely be thrilled to see Princess Anna live on ice ! My gal loves all Disney Princesses! She will definitely be thrilled to be seeing life sized Princess Rapunzel, Princess Ariel, Queen Elsa and Princess Anna! It will be a night of non stop screaming for excitement for her! My girl would love to see the stars from Frozen, Elsa and Anna! My kids love Frozen, but my personal favourite is Sebastian! Wow ! Wow! Wow ! All my little girl's favourite Disney Princesses ! She will surely jump and scream with joy because she is a huge huge fan of these beautiful characters. I hope to win these tickets for her cos March is her Birthday month and I really hope to give her this wonderful surprise that will make her smile from cheek to cheek.Please bring smiles and good news for us and hope my wishes will come true. My girl loves all the characters but I know she is looking forward to see Queen Elsa , Princess Anna and Princess Ariel the little mermaid ! Thank you for this wonderful and magical giveaway. Happy New New to you and your family. Gong Xi Fa Cai !! She would love to see Elsa. my both kids love Olaf Elsa and Anna . hope to surprise them and bring them smile. both of them will be super excited to this performance . My boys can't wait to see Olaf and Anna!!! Kimmy is such an Elsa fan. We had her long hair cut for personal reasons and she has been upset for a while (no longer a proper 'Queen Elsa'. Loves to be in her Elsa inspired costume and certainly will let her dress up as one if we win this giveaway which will also be just in time for her birthday next month!